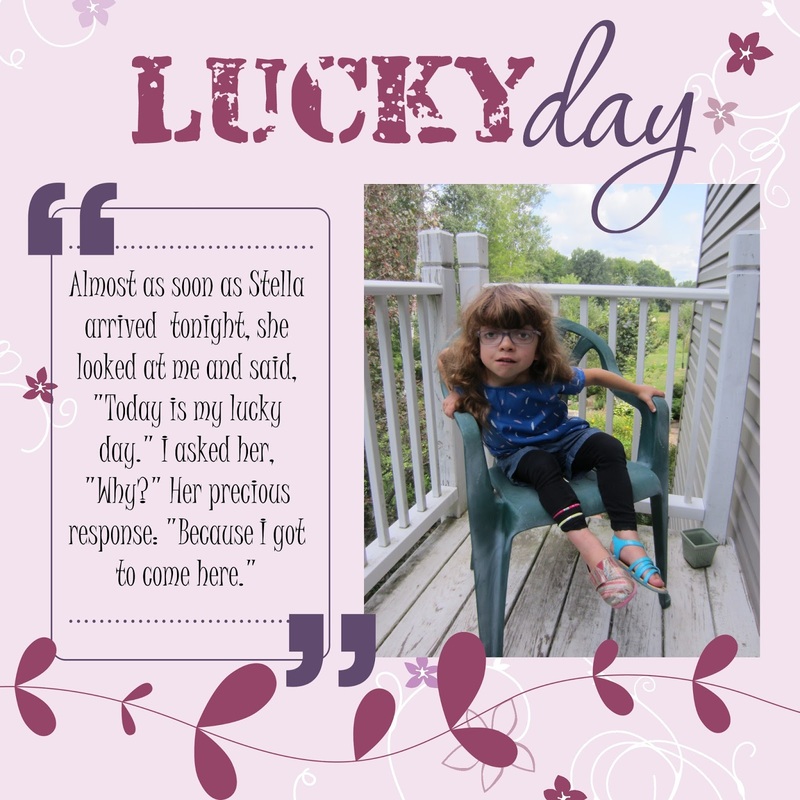 A couple weeks ago, when Stella was here for a visit, she said something so adorable to me that I was moved to memorialize the moment forever. I logged onto my trusty MDS (My Digital Studio) to create a page that would do the job. Shades of purples are usually not a color palette I would choose for a scrapbook layout. However, the little quote box I used for our conversation allowed my background paper to show through. So, it was essential that the background paper I chose was not too busy. In checking through the DSP I have available in my MDS stash, this darling paper from the Cottage Wall series was perfect! So I went with the purples. It was easy to go back to the project and find the list of supplies that I used in the creation of this page. When you have the project on your MDS screen, from the top left menu choose Project. From the drop down menu, click on Check Project, and from there, you can select the Project Supply List. You will have a concise list of EXACTLY what you used in your project. It even gives you the option to print out your supply list for future reference. Besides the DSP I already mentioned, I used solely stamps for the rest: the word "day" came from Word Play; the quote box from Delight in the Day: and the word "lucky" and the vine border from Simple Snapshots. The DSP had a few floral elements that added the perfect touch besides the stamps I chose. I didn't want any more clutter since I wanted the quote and the cute photo of Stella to be the stars of the page. I think I AM the lucky one! P.S. Don't you just LOVE her shoes??!? I love the page you made and of course Stella is precious. Her shoes are cute, I think they're different patterns right? How precious! It makes everything you've ever done worthwhile! Sweet hugs! How beautiful. Stella is a cutie and I love the layout! Awwww...such a sweetie! Thanks for sharing on The Creative Home & Garden Hop...hope to see you again today! Totally precious. Thanks for sharing on BeColorful. What a super cute page you made. Aren't kids just so heartwarming when they say things like that. Thanks for sharing at this week's party!